Jambalaya is a basic rice dish that is a staple in Louisiana Cajun cuisine. This spicy rice dish is ubiquitous at festivals and parties through out the state. 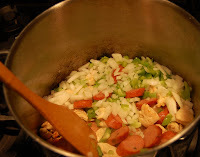 (See our Jambalaya post) Unfamiliar with Cajun cooking? Looking to try Jambalaya at home? A jambalaya mix is the way to go! Just add your preferred type of seafood, meat or poultry and let the simmering spices fill your kitchen with the smells of home cooking. I was originally skeptical of a boxed mix, but after trying Mam Papaul's Jambalaya recipe mix, I can whole-heartedly recommend this Jambalaya mix. It has a good balance of spice and seasoning. It was mild enough for my 7 year old, but spicy enough for my husband. Try it at home! I know you will like it, too! The Jambalaya box mix contains a package of rice and seasonings (shown above.) You will need to provide the meat you prefer (apx.½ pound per type) and an optional 4 tablespoons of tomato sauce or ketchup. I added fresh chopped bell pepper, onion and garlic to my Jambalaya mix along with Tony Chachere's Seasonings. These additions is optional. It would still be good with out them. 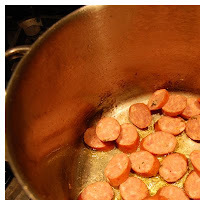 Add a small amount of oil to the bottom of a dutch oven (just enough so the sausage will not stick to the pan). Heat on medium-high. Saute sausage* in the pan. The sausage will render some fat and seasoning to help season/saute the other ingredients. * I used a milder green onion based smoked Cajun sausage from Manda, but any smoked Cajun sausage will work. Add chicken pieces to the pan. Season with Tony Chachere's. 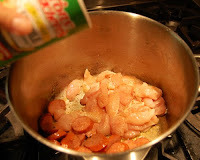 Saute this mixture until chicken is fully cooked. Add vegetables (garlic, bell pepper, onion.) Garlic should be finely minced. The bell pepper and onion can be cut up as preferred. Some may like chunkier vegetables that you can see. Others may want vegetables minced into finer pieces that blend in. Once veggies are tender, add water or seasoned stock, 2 cups. I used water. Then, add tomato sauce or fresh tomatoes, if preferred. Pour in the contents of Mam Papaul's rice/seasoning packet. Stir to combine. Cover with lid. Lower heat. Simmer for 20, until rice is tender. Chicken and Sausage Jambalaya Serve up this delicious chicken and sausage Jambalaya rice dish with a simple green salad. My family loved it. This Jambalaya box mix was quick and easy with a nice spice blend. 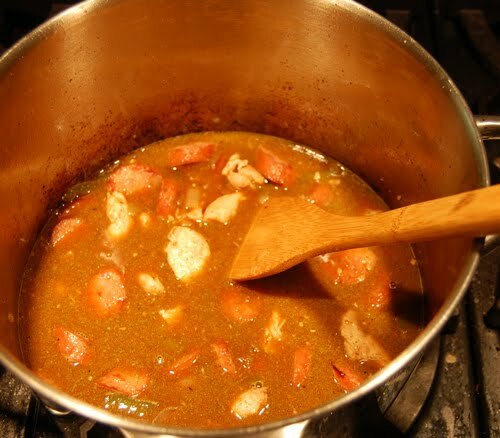 I hope you will make this Cajun dish at home for your family some time. Enjoy! Great pixs and sooooo good. This is such a good meal and quick to make. Looks great! I didn't know there are Jambalaya mix's out there.